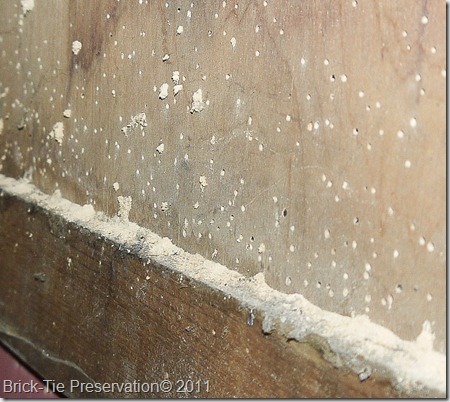 You are here: Home / Timber Infestations / 'Woodworm' / Woodworm in houses–some timber survey tips. Woodworm in houses–some timber survey tips. Whilst we are nearing the end of the flight season for Common Furniture Beetle Anobium punctatum, the holes the buggers make don’t heal up and you’ll come across them all year round. 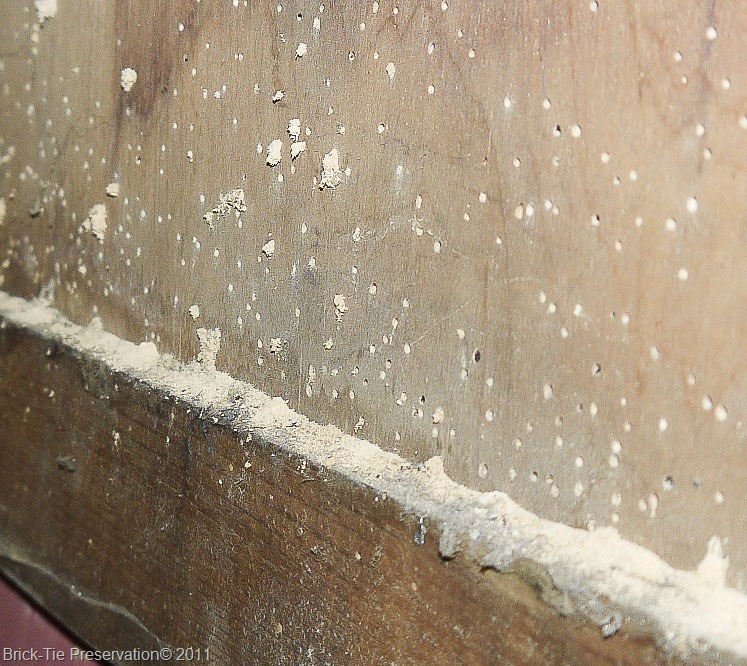 Above – Fresh flight holes in the back of a casein glued plywood cupboard. Note the fresh frass ejected by the emerging beetles. 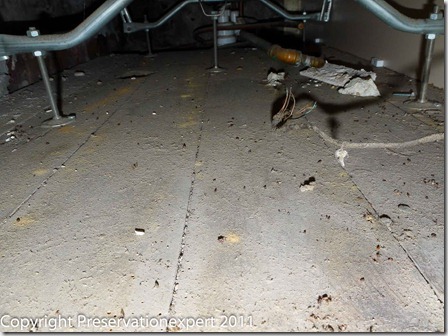 This post is designed to illustrate some of the pathways these critters take through the house and also explode one or two myths, such as the one that active infestation needs damp and doesn’t occur in centrally heated houses. This survey is in a pre-war semi North of Leeds, West Yorkshire. The property was occupied until very recently and is ripe for refurbishment. I was called in to check it for damp and timber infestations. There was some ‘rising damp like symptoms’ but this was all due to bridging issues so no DPC injection required. Above – the layer of dust under the bath betrays the activity here – note the golden colour of the Common Furniture Beetle’s frass, in contrast against the grey and dusty floorboards; piled up over new flight holes like tiny mole hills – this is a dead giveaway of activity. There are many dead adults scattered about here too. So you want to find some woodworm? To conclude the lesson; some further tips for surveyors or homeowners on the lookout for infestation. If you can get access to all the timbers then check them all; there are hotspots but the infestation could be anywhere. However, not all timbers are accessible and time may be short so what are the best locations? Any damp timbers, such as underneath bath, under poorly ventilated floor voids and in the roof, under the valley gutter linings, near the chimney and such. Any wany edges on bigger timbers – sapwood there so check them (make sure the infestation isn’t Ernobius mollis or you’ll look like an idiot). 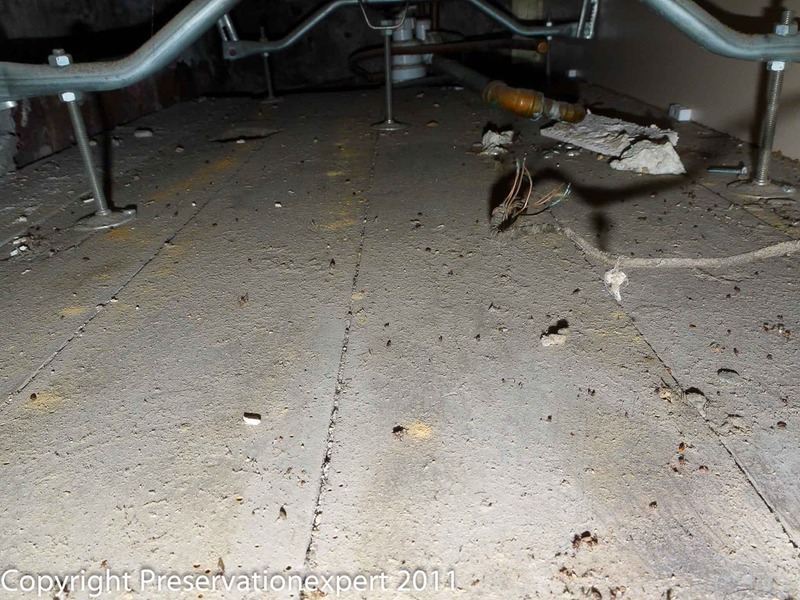 When in the roof, turn off your torch and then check near daylight leakage – infestations tend to gravitate to these light areas if they’ve emerged in less accessible places. (round the hatch is always a good place). Casein glued ply such as in a cupboard or behind electricity meter/consumer boxes. Tea chests and old packing cases or timber beer crates and timbers supporting water tanks. If the rooms have carpets and you can only check some edges, don’t miss the edge under the window – a nice spot to find some. Stairs? The flat sawn treads present a sappy edge at the bullnose – check that if you can. Shine your torch across the surface not directly at it – the thrown shadow relief will make any flight holes stand out. There are many others but these are the ones which spring immediately to mind and your eyes will soon get trained to flick here all the time – having a routine on a timber survey is good – build these and any others into your standard timber survey – I do. Above – This floorboard is actively infested by the Common Furniture Beetle Anobium punctatum. 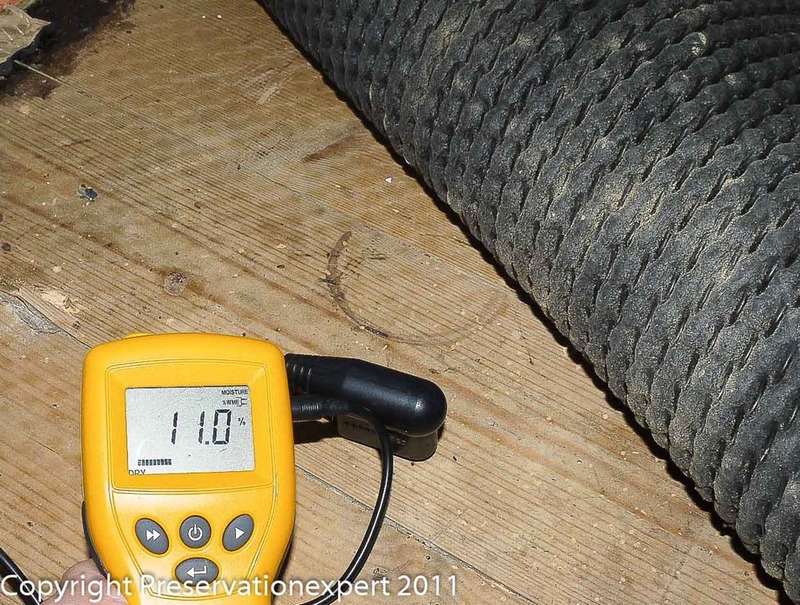 With a Wood Moisture Content of only 11% it is as dry as can be expected. This house is recently unoccupied so presumably the wood was dryer than this, when the heating was on. Don’t be complacent in warm dry houses! However – be aware that after 34 years looking, I still get surprised now and again, so keep your eyes open and if you have the time – check everywhere! Very helpful article Bryan. Much appreciated. This is a great piece. It really shows that you know what you’re talking about and I think it does get across all those misconceptions created by the conspiracy theorists!!! Thanks for sharing it with others. By the way, the glasses don’t look too bad!! Thanks for looking in. Praise indeed from an experienced industry guy like you; when did we first meet?….1985 or so in Bradford I recall. – I was picking up some DPC injection and insecticidal fluid from Safeguard’s Bradford depot on Lister Street and you were behind the trade sales desk. I was due to inject a chemical DPC in Leeds and spray the roof for woodworm, with my brother Stuart. I remember that you always asked me lots of questions back then. – I may have looked like I knew what I was doing; to the young Safeguard employee, but actually I was flying by the seat of my pants…. (don’t tell anyone but I still am). Seems that these days it’s me asking you for advice Robert; especially when it comes to waterproofing new build jobs….times change eh? Thanks for putting up with a young and very arrogant Dry Rot.